Sam Baker pitched well enough at Hill College in Texas to catch the eye of the Indians. He was taken by Cleveland in the 15th round of the 1990 draft, the selection included on Hill College's list players who went on to the pros. Baker's professional career, though, was a brief one. He played just three seasons as a pro. He never made AA. Baker played his first season with the Indians at rookie Burlington. He got into 24 games in relief, ending with a 4.10 ERA. He won two games and saved five. 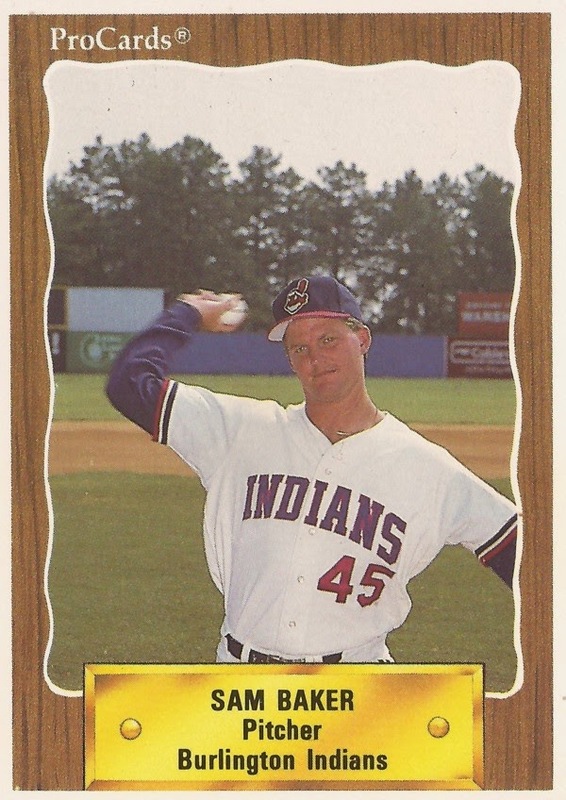 He played 1991 between single-A Columbus and short-season Watertown. He got 22 outings, seven starts, at Watertown. He went 3-8, with a 2.74 ERA. He also saved another five games. At Columbus that year, Baker got into four games, two starts, going 0-3. He returned to Columbus for all of 1992. He also pitched completely as a reliever. In 27 outings, he went 1-4, with three saves. He ended with a 4.26 ERA. It was his final season as a pro.